Selections from Gandhiji's writings and speeches to explain his view on various topics. 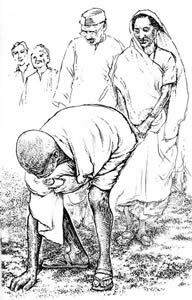 The nuclear tests conducted by India recently do necessitate a study of what Gandhi thought of efforts to arm India and also the nuclear bomb itself. India’s acceptance of the doctrine of the sword will be the hour of my trial. I hope I shall not be found wanting. My religion has no geographical limits. If I have a living faith in it, it will transcend my love for India herself. My life is dedicated to service of India through the religion of non-violence….. If India makes violence her creed, and I have survived, I would not care to live in India. She will cease to evoke any pride in me. My patriotism is subservient to my religion. I cling to India like a child to its mother’s breast because I feel that she gives me the spiritual nourishment I need. She has the environment that responds to my highest aspirations. When that faith is gone, I shall feel like an orphan without hope of ever finding a guardian. There have been cataclysmic changes in the world. Do I still adhere to my faith in truth and non-violence? Has not the atom bomb exploded that faith? Not only has it not done so, but it has clearly demonstrated to me that the twins constitute the mightiest force in the world. Before it the atom bomb is of no effect. The two opposing forces are wholly different in kind, the one moral and spiritual, the other physical and material. The one is infinitely superior to the other which by its very nature has an end. The force of the spirit is ever progressive and endless. Its full expression makes it unconquerable in the world. In saying this I know that I have said nothing new. I merely bear witness to the fact. What is more, the forces resides in everybody, man, woman and child, irrespective of the colour of the skin. Only, in many it lies dormant. But it is capable of being awakened by judicious training. It is further to be observed that, without the recognition of this truth and due effort to realise it, there is no escape from self-destruction. The remedy lies in every individual training himself for self-expression in every walk of life, irrespective of response by the neighbours.